OMG – well I knew November would probably be a very good month for me, but even so – not only a new record but a huge target reached and passed. But with the good comes the bad, so let’s take a look at what happened and talk just a little about what comes next. I know you’re only here for the numbers so let’s get those out of the way then we can talk. These numbers don’t tell the whole story – let’s look at that later. 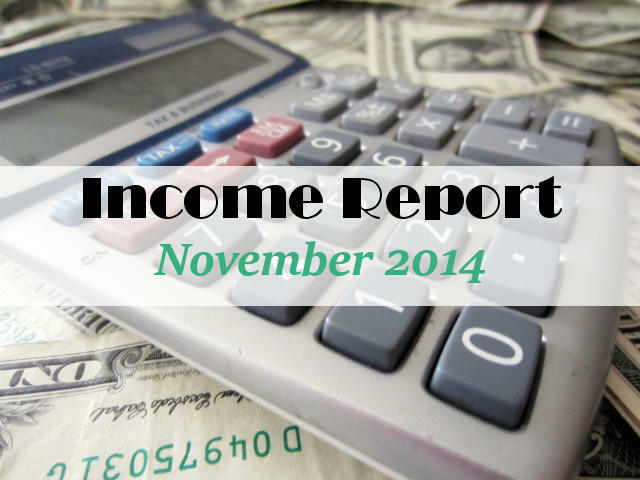 Site RPM in November was a whopping $43.91, obviously reflecting the huge increase in earnings this month. So every 1000 page views earned me $43.91 in revenue. That’s the highest ever rate, but I don’t think we need to look at this as some kind of pattern or trend – November is definitely a one-off bumper month event. Traffic – ah, I’ve been keeping quiet, keeping my head down and not trying to draw too much attention to the fact that Google and Pinterest have been sending me lots of traffic in the last few months – just in case I jinxed it. But it got jinxed anyway and as they say, all good things must come to an end. It happened quite abruptly on 11th November with a sudden drop in traffic from mobile devices and a corresponding sudden drop in traffic from Pinterest. In line with their introduction of paid placements and the new algorithm, So Sew Easy saw a sharp decline in the number of times my pins were shown in people’s newsfeeds on Pinterest, and traffic immediately dropped as did the number of repins, obviously, which also resulted therefore in reduced impressions and traffic. At one point my Pinterest traffic was down over 50% over the previous high in October and November. Drastic action was called for! Pinterest investment – you’ve heard me mention ViralWoot a few times on the site because they have a lot of great free tools for bloggers, such as the ability to schedule pins and also now schedule repins too. They also allow you to promote your pins through their system for other Pinterest users to repin, and you pay for this with seeds or points. You can earn points for free within their system or you can buy them. I wanted to see straight away what an impact this could have to recover my numbers and so bought some points and started to promote my existing pins. You can see from the graph when the decline started and how sharply it fell then the second arrow shows the point I invested in Viral Woot in early December and how the paid for repins made an improvement in my Pinterest traffic, although still not back up to the level it was before. That amount I invested of $59 has just run out and you can see at the end of the graph, traffic is starting to decline again. Clearly I don’t want to spend that kind of money every 2 weeks to keep my Pinterest traffic high, so I’ll just have to accept the lower traffic going forward. So this is where SEO really annoys me. Nothing at all about my site has changed. My topics and keywords are still the same, I still have the same great articles I had before, my keyword strategy hasn’t changed, I’m not doing anything different. But suddenly Google changes it’s mind and doesn’t send those people to my site any more. So basically nothing I did took that traffic away – which means despite all the stuff you read online about SEO – it won’t in the end be anything I do that brings any of it back again. Just like when it suddenly halved last time, and then suddenly increased again a year later – none of it is anything I do. So in summary – traffic has taken a big dip because the two biggest referrers both decided to not send so many people my way and its continuing to decline. Not yet sure how low it will fall, (although December will be much lower than November,) and when it might start to level out, but hopefully in January lots of people will take up sewing and start looking at So Sew Easy as a great resource. Fingers crossed. Pattern sales – one of the pattern releases went crazy in November – the Ultimate Wallet pattern and pattern sales numbers were a record. Now I’ve got 18 patterns in total for sale, I can see more easily which are most popular. It’s actually the bags which sell the best – by a very long way. Interesting, because a bag can often be less work because there is no pattern grading into different sizes, but a more complicated bag can take many hours to develop because of all the small pieces that have t actually match together accurately. But my passion is sewing clothes – so which way to go in 2015 – clothes which I enjoy but don’t sell so well, or bags which are still fun and better sellers. Advertising revenue – I wrote last month about how Blogher was awful in October, but November was even a little worse, so I left the Blogher Network on 1st December. I’m still trialing this new network and the results haven’t been great yet but we are working together on different options to see what works best. It’s been a very disappointing Q4 for advertising revenue all round. Affiliate networks – I joined a few new networks in November and added a wider range of merchants to my promotions. One in particular is doing well – the Affiliate Window network has the Etsy program, so sign up there and you can earn 5-7% on all sales you refer to Etsy. I mean to do an article about Affiliate Window because their system really is excellent – they automatically convert all of your site’s existing links to affiliate links and you don’t have to do anything! I immediately saw a pretty good return for just a couple of posts on Facebook promoting a couple of cheap products. Remember, with affiliate marketing, you earn money on anything they buy within the cookie period even if they don’t buy the product you are linking to. Etsy is a great program to join if you are a craft blogger or have an audience who might appreciate handcrafted goods or supplies – however its closed to US residents at the moment. If you are in Canada, UK, etc – get over there and sign up right away! 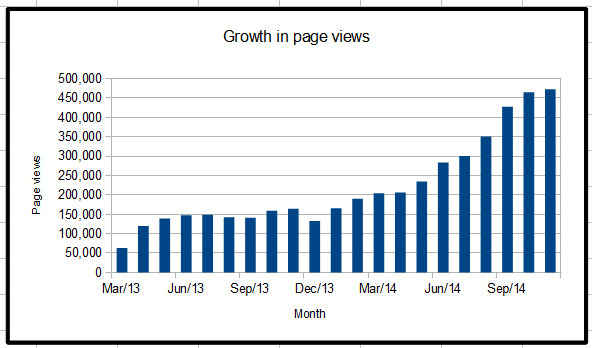 December – I’ll be watching my graphs and sighing a lot this month to see the site traffic fall away. I’ll also be seeing my income return back to normal levels, and predict about $12-13k for December. If traffic continues to decline then income can only follow, but I don’t think I’ll starve! I’ll be working on my schedule for 2015, deciding what to post when, looking for themes to write about and hope that good content equates to good traffic. These figures really inspire me. I hope to reach such heights someday. Again, your numbers amaze me! I need to get a better Shareasale strategy going! Great job! It honestly amazes me too Jann. Another awesome month. I appreciate that you share- I am often feeling a loss of motivation with blogging, and this pumps me up again! I do keep trying new strategies- decided that I needed to add another blog to my collection- just starting it really. Hope to see some results in a few months! I always read your updates riveted. You’re an inspiration. Thanks for sharing so openly with us. This is awesome. Thank you so much for sharing. I usually just read the income reports from Pinch of Yum but after browsing around to some other reports today, I’ve noticed just how different everyones methods of/success with monetization are. I’ve only been using Adsense up until now but have finally started to make some affiliate sales..I guess I just have to keep experimenting and figuring out what works on my site. Thanks so much for sharing all these insights! You are right, different things work for different sites because we all have different methods and different topics and audiences. I know they do really well with their e-books, but I think recipes and cooking are easier to put in a book than sewing. I prefer videos for mine. Now if I could get people to pay to watch my videos – I’d be made! Your blog is always inspiring. Honestly, I have created blogs and have them monatized but it seems like a single cent is very difficult to get. When I look at your blog, I have more power to go on despites all the difficulties. It can take a lot of trial and error to see what works best for your site and your audience, then when you see what works you can hone in on that for greater results. If it doesn’t work, try some different angle or topic. If you continue to work hard and think it through well, you will become successful. amazing and inspiring! are the number of visitors and earnings from this site only, or from your sewing site as well? Its from the two of them combined. In the last couple of months I’ve been splitting the traffic in the reports so you can see that most is to the sewing site.